Note: There is a 2 room suite that 2 people can share to make this a 10 person house. 9-10 bedroom house for rent with 5 baths and 2 kitchens. Terrific location – three blocks from the SAB. The house has carpet and hardwood floors, cellular blinds and two kitchens. The house is partially furnished and has FREE laundry, washer and dryer, plus lots of FREE parking. Cool party room in basement with an egress window! Rent this whole house for your 9-10 person group, 11 person max. 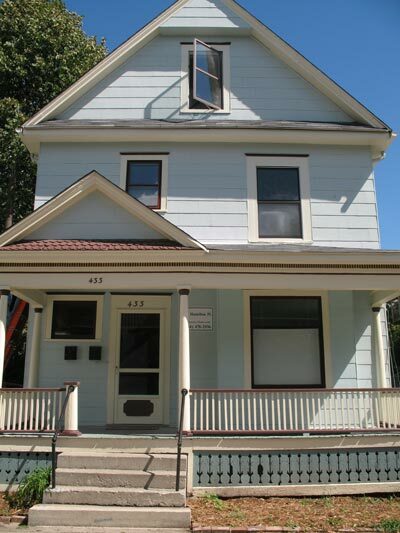 This house is located near Jefferson and Division, very close to the University of Michigan SAB. 9-10 Bedrooms; one bedroom is a suite consisting of 2 rooms. This house is furnished with beds, computer desks, armories or dressers and some living room furniture. Kitchens have a stove and refrigerator and one dishwasher in the house. We offer monthly cleaning service for the common areas free of charge. Lawn and snow service are also provided. 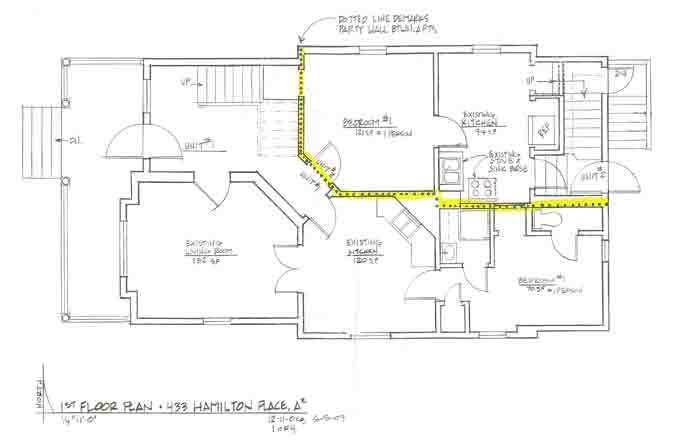 Map of 433 Hamilton Pl. 1st Floor – Front entry, front stairs to 2nd floor, kitchen, living room, bedroom with shower, toilet and sink. Kitchen in the back of the house too. 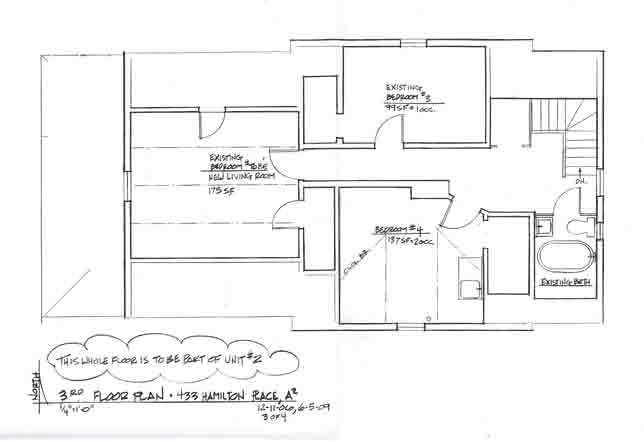 2nd Floor – Bedroom suite (2 rooms) for 2, plus 2 more bedrooms and a dressing room or bedroom with attached full bath. 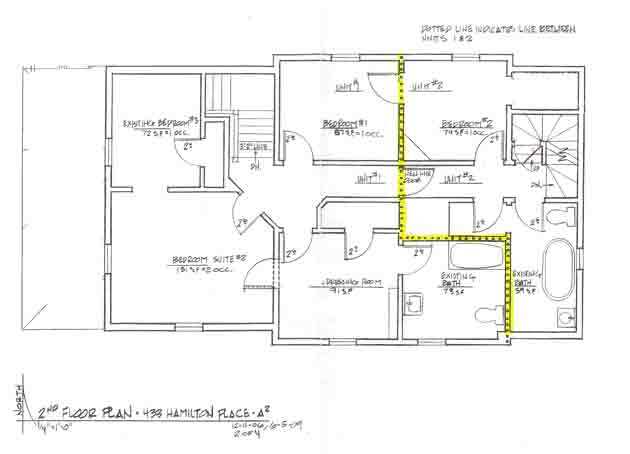 3rd Floor – half bath with small tub, 2 side bedrooms and a huge living room or use as a bedroom. Basement has an additional bath with shower and free laundry plus a party room. Use LED light bulbs. We have them installed. Turn off light and electronics (computers) when not in use. Close the windows and storms in the winter when the heat is on. Have leaky faucets and toilets repaired. Water averages about $15-$20 per person per month. If you have any leak get it fixed asap because it can really increase your water bill. Let us know. We’ll fix it.